The Canadian Reformed churches want to sing more hymns. Regional Synod West has confirmed that in their meeting November 5 2018. Local churches, ministers, and church musicians have confirmed this desire. The limitation of the songs that can be sung in church, is the primary issue. Regional Synod West states that this topic lives within the Canadian Reformed Churches. I am familiar with this. I kept many articles from when I was a teenager, when our Dutch churches called for more songs to sing. It lived within the churches. Just a few years ago they adopted a new hymnal with more than 1,000 songs… but that was not enough. Although it was never the goal two decades ago, now the Dutch church order does not limit the song selections anymore. The URC was formed to remain faithful to God’s Word. That is their motivation. They desire a songbook for the churches in the 21st century that supports them in this. It is not about wanting more hymns, but needing a songbook that is based on their history, shows their culture, and reflects their identity. As Michael Kearny said “It Will Help Our Federation Establish Its Identity” (http://www.reformedfellowship.net/why-your-church-needs-a-n…). The songbook and church identity are closely related. 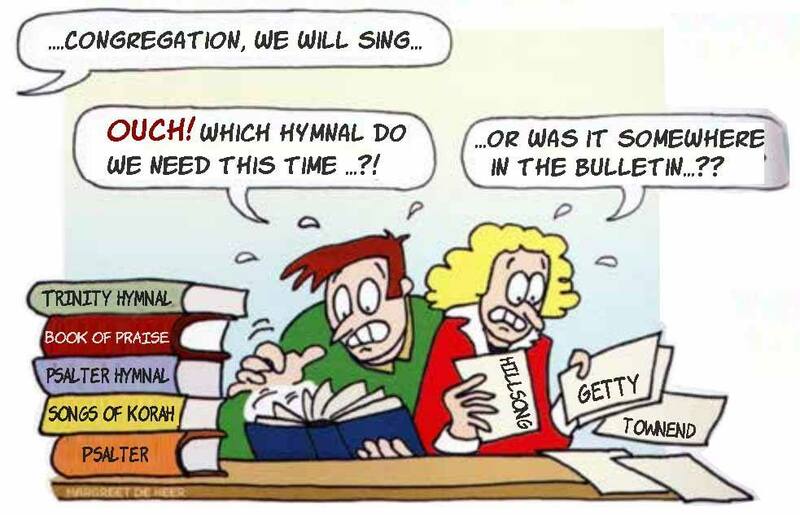 The OPC uses the Trinity Hymnal and Trinity Psalter, but in 2006 their general assembly concluded (https://opcgaminutes.org/…/uploa…/2018/04/2006-GA-73-red.pdf) that greater continuity among the congregations in the federation was needed, and that the used settings of Psalms were not always intact, and often paraphrased. This started their pursuit for a new songbook for their congregations, to unify them and bring them together. This motivates them. Over the years this turned out to be more important than the number of hymns, or even the language. It is not about more hymns. I like hymns. It is not about the URC or OPC either – like their direction. But it is about the CanRC motivation behind wanting more songs in church. I have heard the call “We want more!” heard loud and clear, like a drip on the forehead, since we arrived here 20 years ago. The “yoke” of Article 55 seems to be weighing heavy on the churches. Now, in words there is a desire to follow the URC in adopting their songbook (unilaterally, “to enhance unity”? ), but in spirit there seems to be a desire to follow in the footsteps of their Dutch sister churches, the Christian Reformed Church, and others?